This week’s Photo Challenge Half and Half asks us to share an image that represents two clear halves, literally or figuratively. Meet Fat Betty. 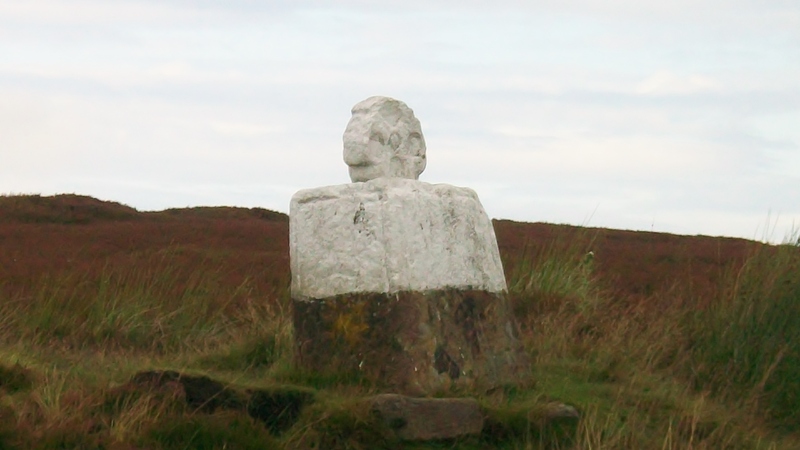 She stands on the Coast to Coast walk in Northern England, on the bleak road that leads across the North York moors from Blakey Rigg to Rosedale Abbey. The head of the cross is an ancient wheelhead half-painted white. Out on the moors it just you, the brooding sky and the purple heather that stretches out for miles ahead. I thought Fat Betty made an interesting contrast to the already bisected vista, at least until the fog comes down and everything disappears. Did you do this walk? It’s on my to-do list! I did, back in 2009. It was actually my first set of blog posts. They aren’t very good as I tried to blog from the road and was too exhausted most nights to write much, but they are on my blog under Hiking Adventures. Its a really great walk. I highly recommend it. Do you know why it’s called Fat Betty? I did look that up. It turns out that there are a number of legends and no one is sure what the true origin is. I like the one about the farmers wife that went out on to the moor and turned into the stone. I think that was Betty! I like that too !